Bihar Staff Selection Commission (BSSC) released the recruitment notification for a large number of posts. The BSSC Notification 2018 includes 31290 posts of Anchal Nirikshak (Circle Inspector), Special survey assistant, special survey Amin, Executive Assistant, Clerk/Special Clerk, IT Boys, and Data Entry Operator (DEO). Candidates waiting for BSSC Recruitment notification 2018 can proceed to apply for the announced posts through BSSC Official portal, bssc.bih.nic.in. Candidates who are seeking to get Bihar state government jobs can apply for BSSC Anchal Nirikshak and other posts. The applicants must possess a suitable educational qualification and eligibility standards to apply these posts. Candidates can check the vacancy details, required educational qualification, age limit, application process, selection process details from the BSSC Official Notification 2018 clearly. Here we have listed the brief information of all the details in this article. 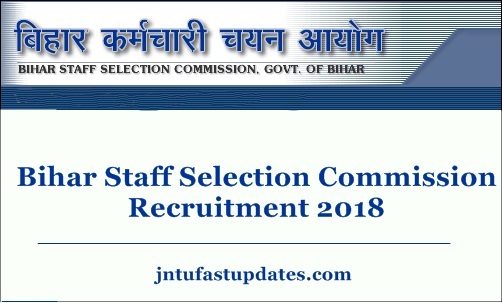 Bihar Staff Selection Commission (BSSC) is the Bihar state government organization that releases various recruitment notifications every year. The organization carries out the whole selection process of aspirants into various government jobs in Bihar. It releases various recruitment notifications based on recruitment. The BSSC has recently released the recruitment notification for 31290 posts. Candidates must have the suitable educational qualification and age limit to apply for the BSSC posts. Candidates having the suitable eligibility standards can apply through online at bssc.bih.nic.in. Before applying for the BSSC posts, candidates have to refer to the official notification clearly once. Selection Method Written Test & Interview. Applicants must have the education of qualification of any graduate degree in any stream from the recognized university. For designation-wise educational qualification details, aspirants can refer to the official notification once. The applicants must also have suitable physical standards to apply for Anchal Nirikshak (Circle Inspector) posts. Aspirants can find the details from the official portal, bssc.bih.nic.in. The age limit of the applicants must be in between 21-37 years. And the upper age limit will be exceeded up to 40 for reserved category candidates. Candidates will be shortlisted through the written test, interview and other rounds based on the designation. Applicants can go through the official notification clearly to check the selection process for each post. Candidates shortlisted in the selection process will get a good pay scale of Rs. 9,300 to 34,800/- The pay scale is different from post to post as per the norms of Bihar Government. Aspirants seeking to apply for Bihar SSC Posts must have to pay the application fee as fixed by the organization. Candidates applying for the BSSC Anchal Nirikshak posts can pay the application fee using the debit/credit cards. How to Apply for BSSC Anchal Nirikshak and other posts? Candidates seeking to apply for BSSC jobs can apply through online at bssc.bih.nic.in. The online application for Bihar Anchal Nirikshak and other posts will be accessible on the website during the application dates. By clicking on the application link aspirants can apply within the scheduled dates.